Li Peng (1929- ), native of Chengdu City, Sichuan Province. Chairman of the Standing Committee of 9th National People's Congress (NPC); Standing Committee member of the Political Bureau of 15th CPC Central Committee. He was elected Standing Committee member of the Political Bureau of 15th CPC Central Committee in September 1997, and chairman of 9th NPC Standing Committee on March 16, 1998. Li served as the Chinese premier after 1987. Son of a revolutionary martyr, Li acquired his higher education in the former Soviet Union. Renowned as an electricity specialist, he is one of those ranking officials with a technical background in New China. Li was born in October, 1928 in the city of Chengdu in Southwest China's Sichuan Province. He joined the CPC in November, 1945. Li studied at the Yan'an Institute of Natural Sciences, Yan'an Middle School and Zhangjiakou Vocational School of Industry between 1941 and 1946. Then he served as a technician in the Shanxi-Chahar-Hebei Power Company and an assistant manager and a Party branch secretary at the Harbin Greese Company. In 1948, one year before the founding of New China, he was sent to study at the Moscow Power Institute, majoring in hydroelectric engineering. During the period he was chairman of the Chinese Students Association in the Soviet Union. Upon his return home in 1955, Li served as deputy director and chief engineer of the Fengman Hydroelectric Power Plant in Northeast China. Later he served as deputy chief engineer of the Northeast China Power Administration and director of its Electricity Dispatch Department, director of the Fuxin Power Plant and deputy secretary of the plant's Party committee. Between 1966 and 1976, he held the posts as an acting secretary of the Party Committee of the Beijing Power Supply Bureau, chairman of the Revolutionary Committee of the bureau, deputy secretary of the Party Committee of Beijing Power Administration, chairman of the Revolutionary Committee and director of the administration and secretary of the Leading Party Members' Group of the administration. Between 1979 and 1983, he served as vice-minister and minister of Power Industry and secretary of the Leading Party Members' Group of th Ministry of Power Industry, and vice-minister and deputy secretary of the Leading Party Members' Group of the Ministry of Water Resources and Power. Li Peng was elected member of the CPC Central Committee at the 12th CPC National Congress in 1982 and was co-opted member of the Political Bureau and member of the Secretariat of the CPC Central Committee at the Fifth Plenary Session of the 12th CPC Central Committee in 1985. 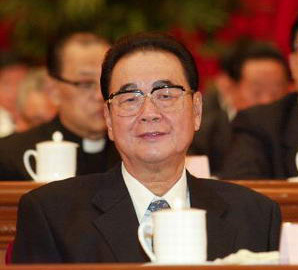 Li Peng started to serve as vice-premier of the State Council in 1983, and took charge of energy, communications and raw materials departments. Beginning 1985, he served concurrently as minister in charge of the State Education Commission. Li was elected member of the Standing Committee of the Political Bureau of the CPC Central Committee at the First Plenary Session of the 13th CPC Central Committee in November 1987 and in the same month he was appointed acting Premier of the State Council. Five months later, that is, at the First Session of the Seventh NPC, Li was appointed Premier of the State Council, the fourth premier in the history of the People's Republic of China. Li was re-elected member of the Standing Committee of the Political Bureau of the CPC Central Committee at the First Plenary Session of the 14th CPC Central Committee in October 1992, and re-appointed premier at the First Session of the Eighth NPC in the following year. Between 1988 and 1990, he served concurrently as minister of the State Commission for Economic Restructuring. He was re-elected member of the Standing Committee of the Political Bureau of the CPC Central Committee at the First Plenary Secssion of the 15th CPC Central Committee in October 1997. Over the past 11 years since Li Peng became the premier, China has scored tremendous achievements in its socialist modernization drive that have drawn worldwide attention. The country's economic restructuring has taken decisive strides forward, opening-up reached a new level, and social productive forces, comprehensive national strength and people's living standards ascended a new stage. Meanwhile, China's exchanges and cooperation with other countries have greatly been enhanced. Li has made quite a number of visits to foreign countries, contributing to the consolidation and development of China's friendship and cooperation with other countries. As the premier of the People's Republic, Li Peng has always kept a packed schedule. Li often went down to grassroots units across the country to do investigations and study. Over the past 11 years as premier, he made inspection on study tours almost all over the country. As the premier, he has paid equal attention to economic growth and socialist cultural and ethical progress. He construed the socialist cultural and ethical progress as ideological and ethical progress and development of education, science and culture. Li showed particular care and attention for the work and life of the intellectuals. According to sources close to him, Li is an unassuming and easy to approach, and good at making friends. Among his acquaintances are common folks as well as political personalities, experts and scholars. Li is well-versed in Russian and has learned English all by himself. He also loves reading. At home, Li is a good helper and often does some house work. Newspapers once published a photo showing Li Peng mending his overcoat. He said he learned sewing in Yan'an in the 1940s when he lived together with children of many other revolutionary martyrs. "Li Peng has not the slightest traces of male chauvinism," said Zhu Lin, his wife. "Whenever he is free, he would lend a helping hand in household chores either when he was an ordinary official or later a minister or even after he became the Premier." Li Peng's father, Li Shuoxun, was one of the earliest CPC members. He was killed in Hainan Island by the Kuomintang when Li Peng was only three years old. Li Peng's mother, Zhao Juntao, used to be an educator and also one of the early CPC members. She passed away in 1985. Li Peng has a family of 11. His wife graduated from the Harbin Foreign Languages Institute and worked in the power departments for many years. The couple has two sons and one daughter. Get your China Visa Online, Fast and easy.